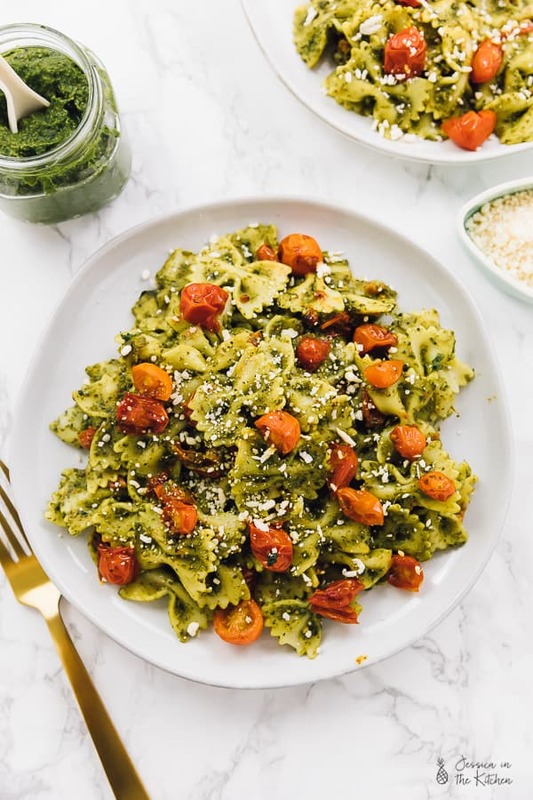 This 20 Minute Vegan Pesto Pasta works so well for a meal prep-able small meal or a large meal. It’s healthy, nutritious, super tasty and so easy to make! I’m currently rewatching Netflix’s Sense8 all over again from the start. If you’ve never watched it, the general basis of the show is shared human connection in an extraordinary way. It’s finished, and unfortunately may not come back, but what a show. It makes me wonder sometimes what being a part of a cluster would be like – aka being so connected to a group of people that you can share their love, their pain and all their experiences. Except I’ve come to realise that we do that every day. Maybe not to the sci fi extent of Sense8, but we all the ability to be so close to a group of people that its as if we are one. We know what makes them laugh, cry, and come together in harmony. For me, that’s my family and I’m so grateful to have such a powerful group of loved ones around me, at all times. Who genuinely look out for me, see me for me, and care so, so much. What do we do for the ones we love? We feed their souls! In my case, it’s literally feeding them. That’s why I love a meal like pasta. It’s such an inviting dish – built for a group, to come around, to share, to partake, to be one. 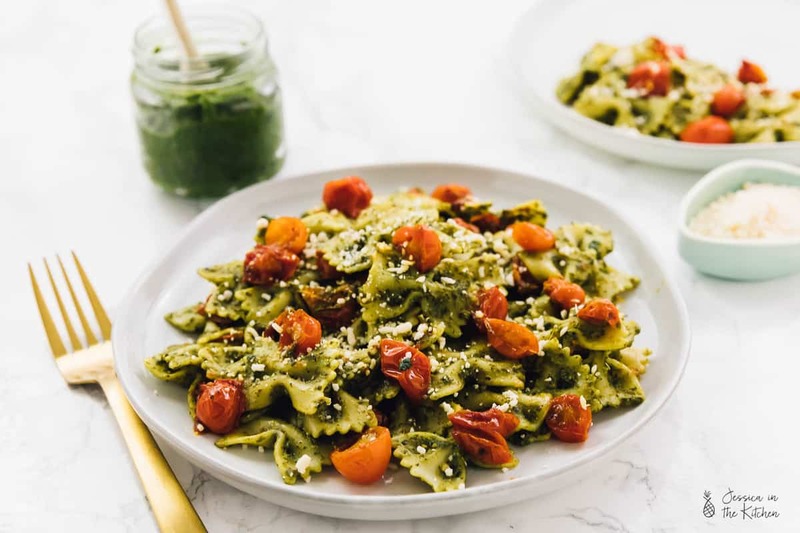 A dish such as this 20 Minute Vegan Pesto Pasta means you don’t have to go out of your way to create an extravagant meal to show that you love someone. It can happen very quickly meal prepping in the morning, or slowly in the evening after work. Your decision. Sometimes all we want is a nice and simple dish like a vegan pesto pasta. I’ve made many a pesto pasta before, and many different kinds of pestos. 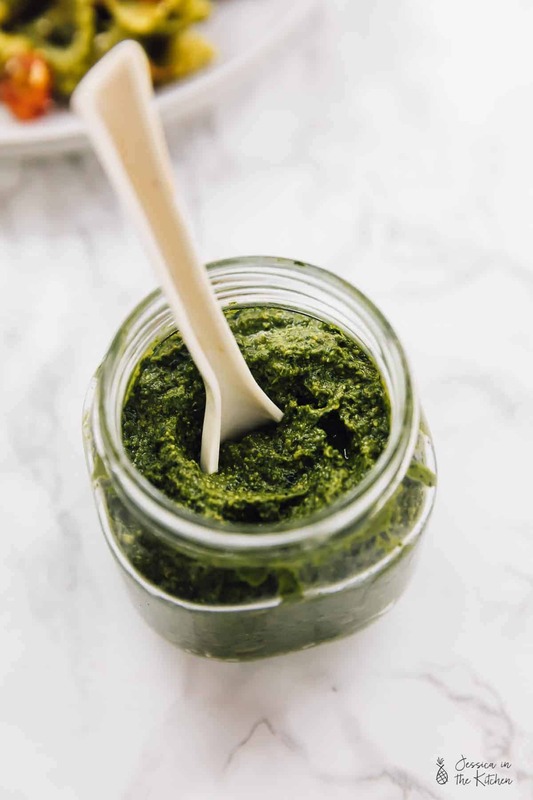 You can choose from parsley pesto, or kale pistachio pesto, a more classic basil pesto or a different creamy cashew pea pesto. I’m including my basil pesto below, although I used a mix of kale for this dish. It’s so easy to customise, so feel free to use what’s available to you. Or maybe you just want a store-bought natural pesto or one from the farmer’s market, which is totally okay too. Food is supposed to work for you, not the other way around. Either way, this creamy vegan pesto pasta meal will work for anyone. 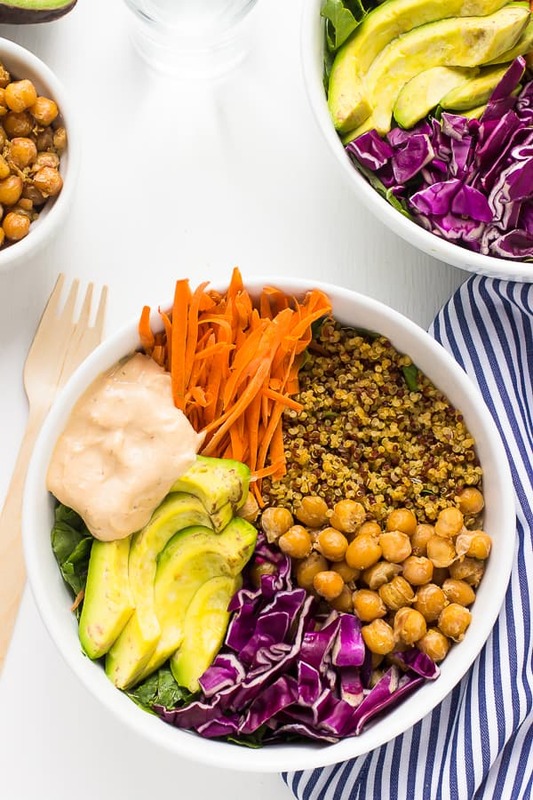 It’s easy to make, loaded with raw nutrition, so tasty and very inviting. chop up ingredients in the meantime and sauté down some tomatoes. when the water begins to boil, add in your pasta. Mine took about 12 minutes to boil. Make the pesto. Add in the ingredients, blend. SO simple. 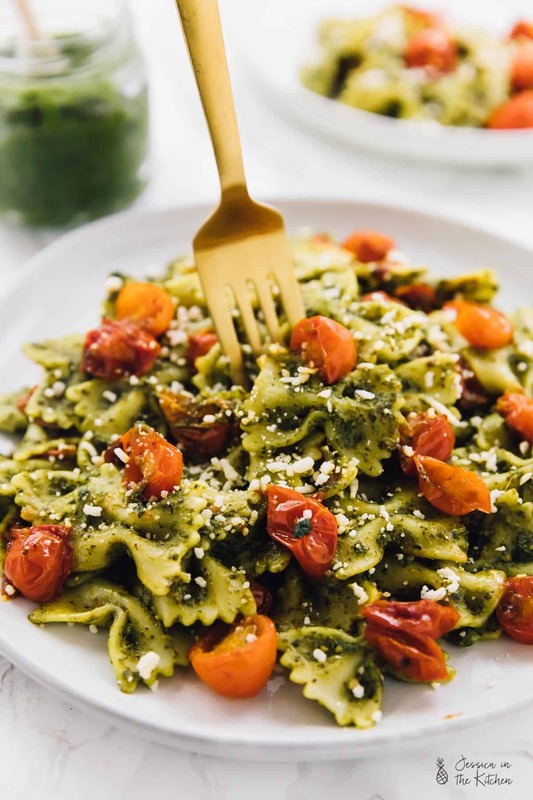 Strain the pasta water, add the pasta to the pan with tomatoes, then stir in the pesto. Serve and enjoy!! Make sure to share this with the ones you love. Enjoy, friends! Bring a pot of salted water to a boil. Cook the pasta to the box or package's directions. While the pasta is boiling, heat the coconut oil to a pan over medium high heat. When hot, add in the tomatoes, stirring and sautéing until the tomatoes are cooked down and burst, about 5 minutes. While the tomatoes, are cooking down, prepare the pesto. Add all the ingredients into a food processor or high powered blender and press the sauce/spread button or blend until combined smoothly, scraping down sides if necessary. Pour the excess into a jar, and use ½ cup for the dish. Strain the cooked pasta, saving a few tablespoons if the pesto is too thick on the pasta. Add the pasta to the pan with the tomatoes, and then pour the pesto on, stirring in. Add the pasta water if necessary. 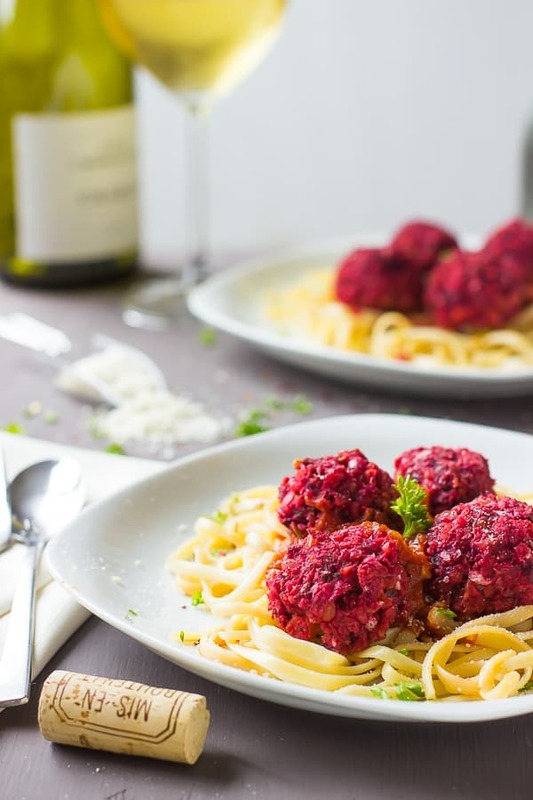 Serve with some vegan parmesan on the side and enjoy! You can buy vegan parmesan cheese too! https://rstyle.me/n/c59kdqbek9f Based on the ingredients it doesn’t look like their is any yeast in this. It tastes much more like parmesan cheese, and is easy to acquire. Alternatively, if you leave out the parmesan cheese, it will alter the taste but won’t make it taste bad, it just won’t be as flavourful. You can try it without it anyway and see if you still like it! I hope that helps! I’m trying to make 2 large trays of this. 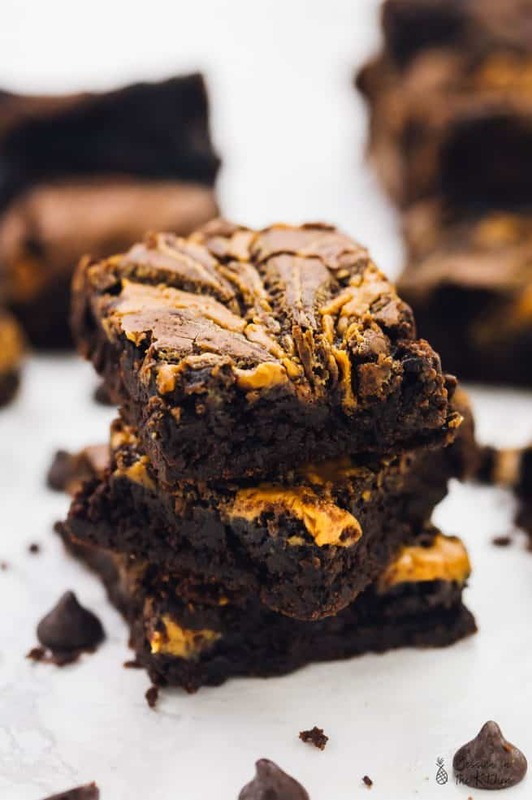 Can you help me size the recipe up please? Hi Jasmine! Sure happy to help how many people are you preparing it for? Hi jasmine this is enough to feed 40 people based on your other dishes.